ALEXANDER HAMILTON. 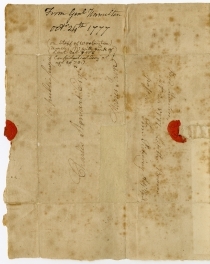 Autograph Letter Signed, on behalf of General George Washington, to Colonel Charles Stewart, Commissary General of Issues, October 24, 1777, Headquarters [Whitpain Township, Pa]. 1p. with integral address leaf note, “Let the Bearer pass. Tim. Pickering Adjt. Genl.,” 13 x 8¼ in. (open). 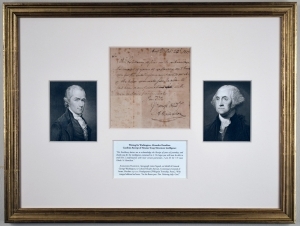 Colonel Stewart had written two letters to Washington on October 22, 1777, from Haddonfield, New Jersey, in the morning, and Burlington later in the day. The first informed Washington of Hessian movements crossing the Delaware River on October 21. Stewart estimated the Hessians numbered between 3,000 and 4,000 soldiers and were planning to attack Fort Mercer. 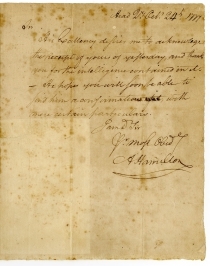 Stewart’s second letter passed on intelligence he received from a man who served as a guide to 2,500 enemy troops—mostly Hessian. He assured Washington that Fort Mercer would be well supplied to withstand an attack. The Hessian attack on Fort Mercer, located on the New Jersey side of the Delaware River just south of Philadelphia, actually did take place on October 22, but was repulsed by a much smaller American force. The patriots’ victory delayed British plans to consolidate their hold of Philadelphia, and relieved pressure on Washington’s army north of the city. Fort Mercer did not fare as well; a month later it was captured by the British. Charles Stewart (1729-1800) was born in Ireland and immigrated to the American colonies in 1750, where he took up farming. He served in the Provincial Congress of New Jersey (1775-1776). When the Revolutionary War commenced, the Continental Congress appointed Stewart as Commissary General of Issues in June 1777. He subsequently served New Jersey as a delegate to the Continental Congress (1784-1785).